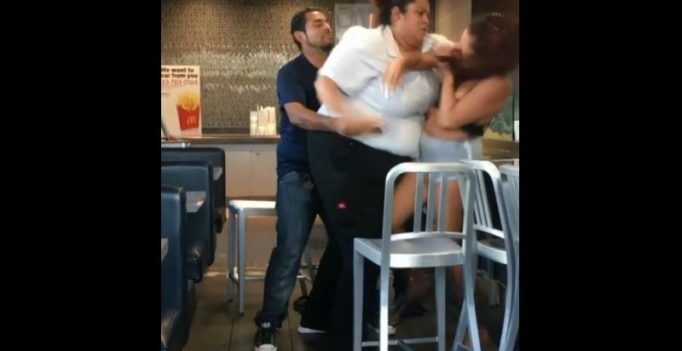 A video has gone viral where, in a shocking moment, a McDonald’s worker was seen brutally beating up a customer after she apparently tried filling up a water cup with free soda. The brawl, posted on Facebook and Instagram by user Marie Dayag, sees her saying that the fight started when the customer tried putting soda in a free water cup. It is not known where exactly the fight took place, but Dayag’s Facebook page says she lives in Nevada and was born in California. Instead, she grabs the customer by the hair and begins raining punches down on her head and face. The McDonald’s employee proceeds to pick her up and throw her over a nearby table as other employees and even a customer runs over to try and break it up. Another McDonald’s worker tries to move the customer away, but the customer then begins fighting her instead which restarts the brawl. At one point the staff member can be heard shouting ‘my momma aint dead, you respect my momma,’ though it is not clear what this is in reference to. The customer also picks up a chair and makes as if she is about to hit the employee, but is quickly disarmed having apparently given up all hope of winning. A few more angry words are exchanged but no more punches are thrown before the footage cuts out. 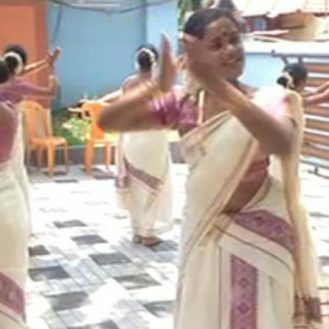 Since being posted on Facebook, the video has garnered 10K shares.